Ahoy there me hearties! Yer favorite app pirate is back again for another dose of app review that this old salt knows ye buckos have been waiting for. There’s this old game that me used to play called the Chuzzle. Me really enjoyed those little bouncy, fluffly round characters in the game. Plus, ye know that this old salt loves match 3 puzzle games, aye? The game up for review today immediately reminded me of the app I mentioned. ‘Tis called Chibble by Cold Cows Studio. Avast ye and let’s start. 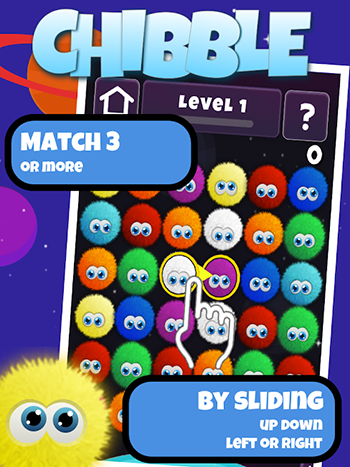 If you have played the old Chuzzle game before, you will immediately realize that Chibble is a replica of it. It’s a good thing if you really love the said the game and you missed playing it. However, if you are looking for something fresh, this may not be the one for you because as mentioned, it was clearly copied from the old game. The round, fluffy characters look identical and the basic gameplay is the same, which is to match 3 or more of the characters. The only difference that you will see is that the hint and level is on top in Chibble, while they are on the left side in Chuzzle. This game is simple to play, making it appropriate for children and adults. The gameplay is pretty easy to learn. If you are a fan of match 3 games, then you would immediately know what to do. Just match three or more of the same color of the characters to earn points and move to the next level. There are locks that serve as the obstacles but aside from them, there are no other challenges in the game. It’s something that you can play on down times or to pass time, especially you don’t lose lives. One of the drawbacks of this game is that controls sometimes do not work well, so you may end up doing the wrong move instead of the one that you were really planning to do. It is also not responsive on all devices as it looks stretched on bigger screens, while the options that you need to access may not be easily visible or accessible on smaller screens. As a free app, advertisements are almost expected and they would not be that much of a problem if they are strategically placed so not to interrupt the game. However, in this app, there are several video advertisements that pop-up, which can affect the overall gameplay or gaming experience. Chibble is free to play and it has cute characters. It is also easy to learn, making it appropriate for players of all ages. There are no lives utilized so you can keep on playing the game as much as you want. It’s not a unique or fresh game as it’s a clear copy of another app. The controls are not precise and the game is not responsive to all devices. 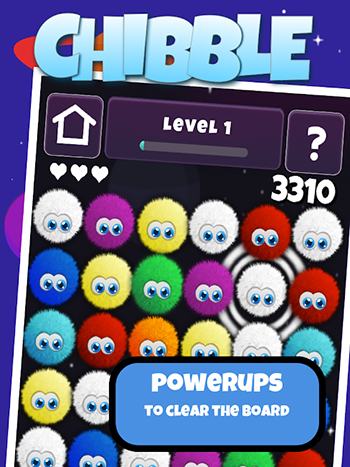 Chibble was copied from an old game, but if you are into match 3 puzzle games and you don’t mind this, it’s still a good app to try, especially you can play as long as you want, making it the perfect time waster.